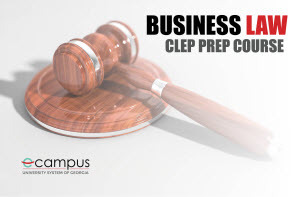 The Introductory Business Law CLEP Prep course will prepare learners to take the College Board CLEP for Introductory Business Law. This course covers content that is usually taught in an introductory one-semester college course on business law. This course not only gives learners an understanding of the functions of contracts in American business law, but also touches the history and sources of American law, legal systems and procedures, agency and employment, sales and other topics. The primary goal of this course is to prepare students to pass the CLEP examination and obtain college credit. However, for those who are not interested in the CLEP exam, the knowledge from this course is still helpful if you will run your own business or deal with legal system in the course of your career. This course consists of videos, interactive materials, readings, and quizzes. Students can earn a badge for achieving at least 75% on the Post-Test quiz. Registration is open from March 25 until April 22, 2019.